Life in beautiful Western Montana has inspired Teshia's uniquely colorful Western Wildlife Collection. She created Bull Moon as a tribute to the majestic Bull Elk that roam the rugged Montana mountains where she lives. While admiring the glowing full moon, casting its bright light over the mountains one night, Teshia imagined all of the wild creatures that must be out roaming around under the bright moonlight. She imagined a huge, solitary, trophy-sized Bull Elk bugling to the same bright night sky....its body vibrant & alive with color & energy, & its steamy breath illuminated by the moon.... Thus, Bull Moon was born. The Original Bull Moon Painting was donated by Teshia to the Loyola Sacred Heart Foundation as a benefit to the foundation. 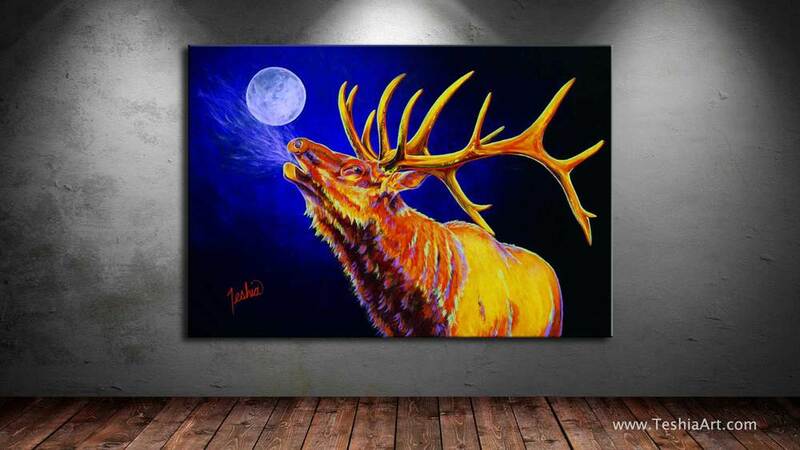 Fine Art Prints of this striking piece have also been donated by Teshia to several outstanding nonprofit organizations, including the Rocky Mountain Elk Foundation. Bull Moon was created using rich Acrylic paints on Heavy-Duty Museum-Style Panel Board. It is finished with several coats of a High-Gloss UV Protectant Top Coat, which further enhances the colors & "pops" the vibrancy of this piece. The Original Bull Moon Painting was SOLD to a Private Collector at the LSH Autumn Art Auction on 10/25/13.